On women in the workplace | Save. Spend. Splurge. Came across this great quote today by Bill Gates*. WE HAD THE SAME ATTITUDES ABOUT WOMEN NOT SO LONG AGO! Before the World Wars, women stayed at home, cooked, cleaned and didn’t have careers. It wasn’t until all the men went to war, that women had to step in, roll up their sleeves and work. Some went back to what they were doing before, others decided they liked working and kept doing it, albeit in ‘safe’ jobs like being a secretary and fighting to be recognized as an equal in the workplace (as a young woman professional, I thank you!). It made me wonder: If there weren’t any World Wars, would women have been given the opportunity to crack that barrier? How long would it have taken? Maybe we would have been in the same position as in the countries we now think are ‘backwards’ and not as progressive. Note: I absolutely acknowledge that tradition and religion plays a big part, so there’s no question that it’s not a matter of trying to preach, be bossy and educate the so-called uneducated to get them to change to what we think is the right way. Those countries are full of extremely educated people who have a different mentality and outlook on the world. It’s more that if the culture dictates certain rules and you want to stay in that culture with the rest of your family and friends, you have to follow those rules. I understand that completely, having known many girls who have chosen that route, even if I would have never chosen that kind of life for myself. Back to us in North America (and even parts of Europe). I am not saying that if you’re in Advertising or Human Resource management that you’re not useful or that you don’t have skills. I am saying that as a society, we don’t seem to value those kinds of creative professions as highly as the ones that require technical know-how, and it shows in the salaries. If as a society, we thought that young girls and women could be fantastic assets in those areas, why are women gravitating towards areas that don’t seem technically-inclined? They’re being pushed towards those professions, unconsciously encouraged to take appropriate jobs and perhaps told from a young age that ‘girls are bad at math and science, so giggle a lot and ask for help from boys‘. As a society, we believe that the money comes with the skill and difficulty of the job. I am not going to get into a discussion of whether or not school teachers or nurses don’t help society (I DO NOT BELIEVE THAT), but this is just an example of why women earn less. We gravitate towards jobs that don’t pay as much. We aren’t encouraged to think and stand up for ourselves. We aren’t taught that there is no ‘girls or boys’ in terms of abilities, there are just people. We are unconsciously putting women down all the time (even as fellow women!) because of jealousy, pettiness and whatever else comes with women hating other women. We (sometimes) assume a man is better in a job than a woman (sad, but true). 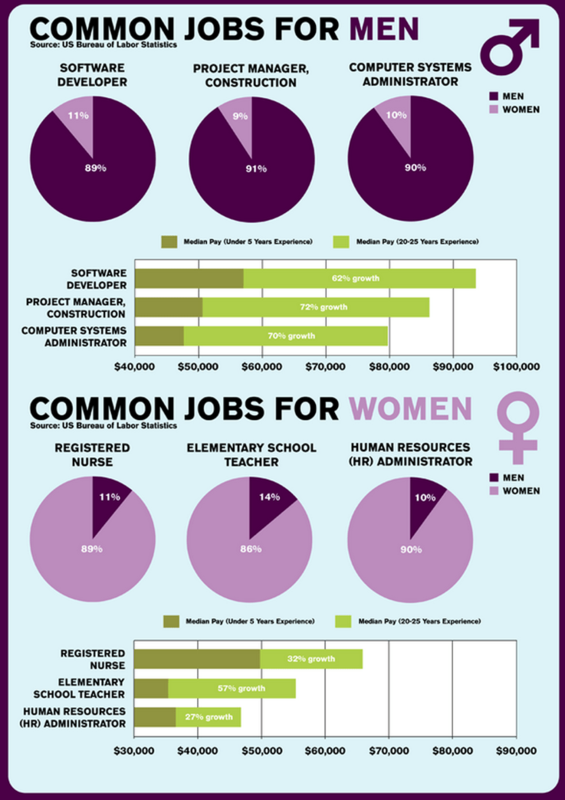 These are all factors in women earning less in the workplace. The good news is that we’re improving, but it has to change with the way we treat and talk to young girls and women. 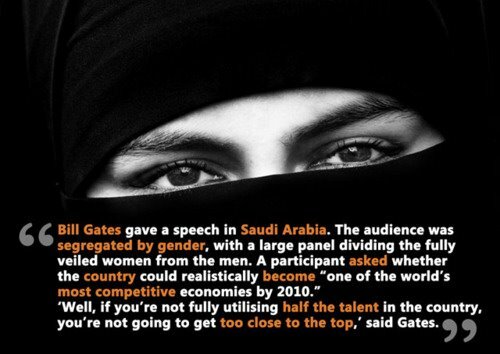 I totally agree with that quote from Bill Gates. It’s also like having a start-up targeted primarily towards women that doesn’t have any C-level women! I wish more women went into software! It is such a great problem solving space. My group has a couple of interns this summer, one male and one female. The male one is overconfident and the female one is underconfident, sigh. Honestly, I think that women would negotiate more if they were more confident in their abilities. At least, feeling more confident has helped me significantly. I’m really bad at donating money and time, but the one thing that I do try to help with is STEM (Science, Technology, Engineering, and Math) outreach projects for high school and middle school girls. I know I’m an anomaly that I have liked computers ever since I was a little kid and not every girl had that experience. I didn’t even know STEM existed!! Thank you. There’s data that suggests women have to work much harder (publishing double or triple the research) compared to similarly qualified men and that people will overpass women for men. Someone did an experiment with orchestras and if the people selecting new members could see the auditioners, they mostly picked men. If they couldn’t see, they picked a balanced lot. Then I’d probably also point out that in that case there is a definite bias against women in addition to other factors. I do notice that women in my field do not seem to negotiate or push for what they’re worth. They always undermine and undersell themselves which is something that hurts our salaries too. They’ve done studies on this and have found that women are grateful when they find a new job and most don’t even negotiate. Women are less likely to risk a new position. Men are more likely to take risks and will negotiate more. My personal thought on this study is that men in many families have to earn the income and support their families so every job they take does affect their future earnings for their families. There’s a lot more pressure to support their families and send the kids to college. I’m not a man but this is what I’ve observed. I don’t think that men have it easy either. They are the ones who had to go to war for centuries and get their limbs cut off in wars they never started. Also in the beginning some women in the early 1800s were against women working and voting. Back in the day society thought that women had to be cared for and protected from the evils of the world. Its not that men were evil and wanted to keep women at home, it was more of a societal issue. They thought like this : Why would a woman have to work unless she was poor, when she had a good husband and he made a good living and had a comfortable home? You have to remember its men that gave women the right to vote. When the suffragettes pushed for voting rights its the men in power that gave women the right to vote. In early U.S. history the only men that were allowed to vote were also those that owned land. If you were a poor man and didn’t own land then you couldn’t vote. Men have had their own struggles throughout history. Life is not easy for anyone. I wasn’t hating on the guys 😉 when I say ‘society’ I meant both men and women!! If anything I think both sides are to blame and it is the collective responsibility to change that. Sorry I didn’t mean to say that you were. I guess I wrote it wrong and its not what I meant. I study astrophysics and only 30% of my year are girls. And our year has one of the highest ratios. So I know exactly what you mean! All the girls in Engineering always told me something similar — that women don’t go into those fields!